There are many ways of drawing anime eyes. 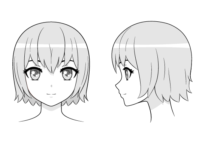 This tutorial illustrates how to draw anime eyes with different expressions in one style from the front view. 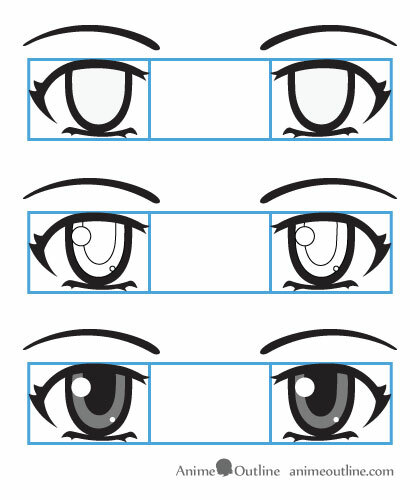 One defining feature of anime eyes is that they are usually much bigger and wider than real eyes; so that is how we will draw them. The eyes should be far enough apart that you can fit a third eye in between. For a normal expression draw the iris slightly covered by the top eyelid while just touching the bottom eyelid. 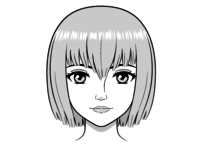 Draw the eyebrows slightly above the eyes in a smooth curve. 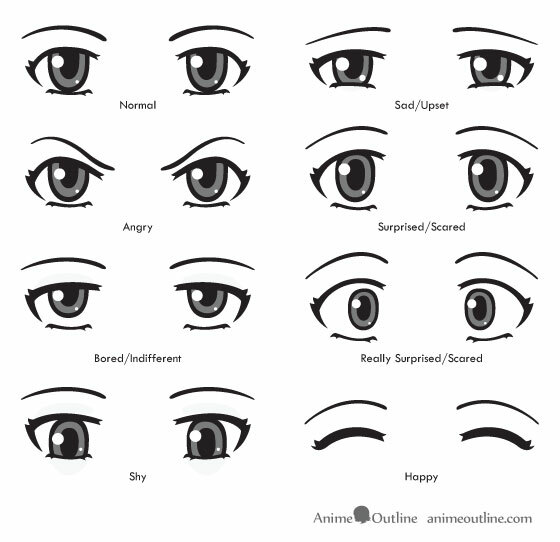 When drawing different expressions the eyebrow shape and positions and the positions of the pupils can be different. Draw the pupil in the middle of the iris. The positions of the reflections will depend on the the position of the viewer. There can be more than one reflection depending on how many light sources there are. In this case we have two. One for the main light source and one from a secondary light source. For example if you are drawing a character that is standing outside on a sunny day the main reflection in the eyes could be caused by the sun while the secondary could come from the sun reflecting off of another object. 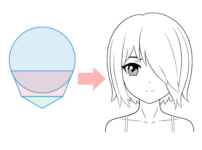 To shade the eyes as in the above example you can pretty much make everything excluding the inner part of the iris and the reflections black. Leave the reflections white and make the iris area grey. 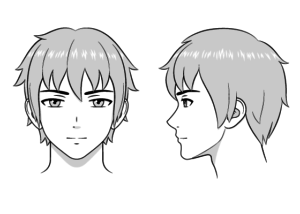 One major difference between drawing realistic eye expressions is that in anime and manga the size of the pupil can be changed to create a more dramatic expression (really scared eye expression for example). 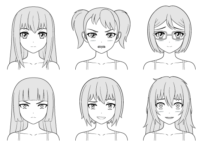 Below is a breakdown of each expression. 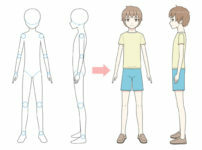 Draw as described above in the first part of the tutorial. For an angry look draw the eyebrows down in a kind of inward wave shape. Draw the top eyelids down in an inward slope and draw the pupils slightly rolled up. For a bored look draw the pupils rolled up and the eyelids slightly lowered. For a shy or embarrassed look draw the eyes looking down and draw the top eyelids slightly lowered. For a sad look draw the eyes squinted. Draw the bottom eyelids in a slight upside down arch. Draw the outer edges of the eyebrows lower down with less of an arch than normal or even in an upside down arch. For a surprised look draw the eyes wide open with the eyebrows raised. The wider you draw the eyes and the farther you raise the eyebrows the more surprised the character will look. For a scared look draw the eyes wide open and the eyebrows raised. You can also draw the pupils smaller than normal. The smaller you draw the pupils the more scared your character will look. For happy or content anime eyes closed with the shape of the eyes in an upside down arch. This is probably the easiest example of drawing anime eyes as there are almost no details to worry about. Real eyes are located in the middle of the head. 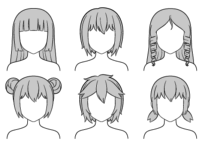 Anime eyes are often draw much farther down the head. 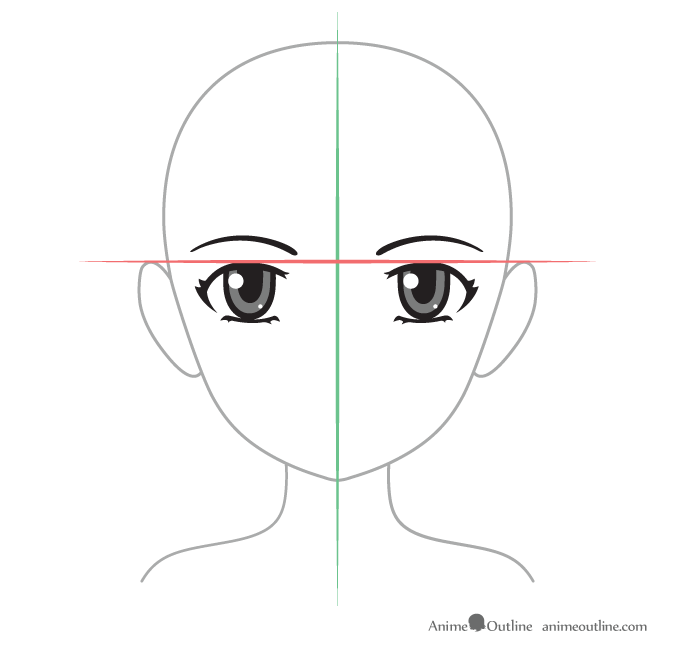 A good guide for drawing anime eyes is to draw a horizontal line through the middle of the head as shown in the above example and to draw the eyes below that. It’s important to note that if the eyes are closed or squinted the top eyelashes will need to be drawn further down from the horizontal line in the example. If the eyes are wide open then the eyelashes will need to be drawn further up. 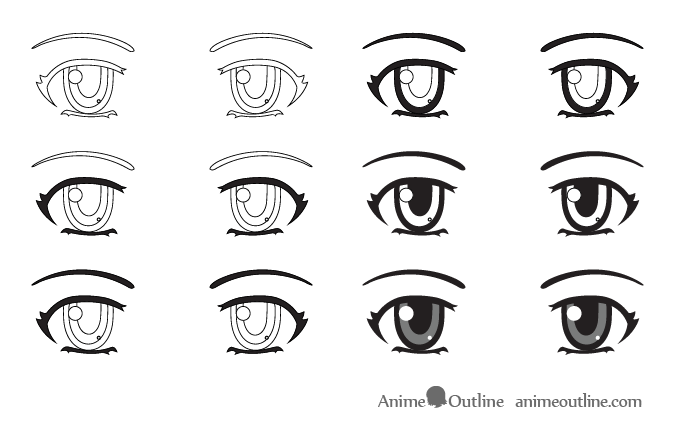 There are almost countless variations of anime eyes but the guidelines and tips used in this tutorial can still apply no matter what style you choose.